♥ Mama 2 Multiples ♥: Baby Watch! We are officially on baby watch! Princess Kendall is due on Wednesday, so ANY. DAY. NOW. I have never been one to be "done" with being pregnant. I have always flowed through my whole pregnancies with no problems at all and never complained, and though I was excited to meet the babies at the end, I was never in a hurry for them to come out and join us, and always said, "They will come when they are ready." This time? I'm over it. This has been the hardest pregnancy I have EVER had. 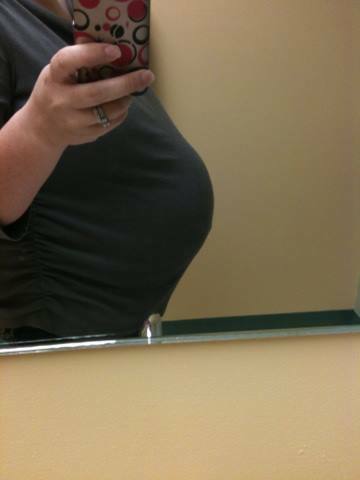 I tell everyone daily that I would rather carry TWINS again, than this one baby for this pregnancy. Everything has been completely different (and not necessarily for the better!) with this pregnancy from the very beginning. First off, there was a ton of stress and drama over whether this was a viable pregnancy earlier on, because of dating being off and ultrasounds not showing what they should have been showing when they should have showed it, and my hormone levels being slow to rise. Second, the nausea was worse than ever before. I never actually threw up with any of my pregnancies, but did have periods of not feeling well or just feeling nauseous, but it was worse this time around. The food aversions were worse this time, as was the exhaustion/fatigue. I've had back pain this time around, something new and miserable most of the time. My pelvis feels like it's being ripped apart even worse than before, my muscles and everything else that could possibly hurt, hurts like hell. This baby has been HEAVIER than the others. It's never been so difficult to get comfortable, like it has been with this pregnancy. So needless to say, I'm done. Over it. Want her out. NOW. Of course I want her to come when she is ready and would never look for inducing even after my due date, but I can't help wishing for it to happen every minute of every day that ticks by right now, since I am SO close to my due date! I do have a feeling though, that she's just going to wait until her due date and be one of those rare babies who arrived right when they are due. Just to be a little stinker.